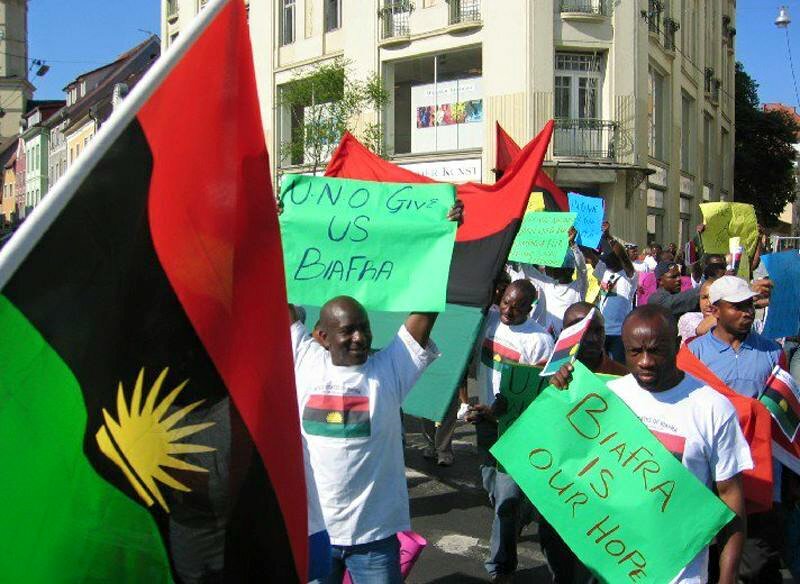 The Indigenous People of Biafra, IPOB, has recorded another landslide victory as the ever sophisticated Legal team has successfully secured the release of the activists who were arrested by Nigerian security agents at Ogbete Main Market, in Enugu state on September 19, 2016. Not less than 12 activists were on Monday September 19, abducted by officials from the Area Command of Central Police Station (CPS) Enugu. The activist were reportedly on a sensitisation rally at Ogbete Main Market which was specifically meant to educate the traders on the need to observe the "SIT-AT-HOME" protest scheduled by IPOB to hold on September 23, in solidarity with the incarcerated IPOB leader, Mazi Nnamdi Kanu, before they were conspiratorially betrayed by the leadership of the Market Union, led by Mr. Temple Ude and his Secretary Mr. Philip Ikeji, who lured them into their office and handed them over to their thugs and inhuman security officials. Eye-witness reports obtained at Ogbete market had revealed that the activists were devoured with merciless beating and severely tortured during the course of their abduction by the thugs and security officials, to the viewing pleasure of Mr. Temple Ude and his cohort Philip Ikeji. Meanwhile, Family Writers, who also had one of the renowned Journalists and Intelligence Officers assigned to cover the proceedings of the rally, as among the 12 activists arrested; have relentlessly followed up the case ever since, together with other Biafran media warriors. However, it was a huge relieve yesterday as the powerful Legal team of IPOB announced the release of the activists pending court appearance. A Family Writers journalist on ground, Mazi Commrade Chukwu Ogbu quickly conducted a snappy interview with the victims of the outburst of tyranny which has become a trade mark and tradition of the Nigerian government led by an unrepentant former Military Dictator, President Muhammadu Buhari. The activists in the live videoed interview with Family Writers which will soon be televised on Biafra Television Channels, gave a first-hand account of the heart-rending circumstances that surrounded their arrest and detention; even as the Cordinator of IPOB in Ogbete market raised alarm over the threat by the Market Chairman Mr. Temple Ude to get rid of him as well as other IPOB officials and members. "My names are Stephen Mmaduaburochukwu Ogbuonu, I am from Nkelefi in Nkanu West Local Government Area of Enugu state. I am a trader in Ogbete Main Market. What prompted my arrest together with other IPOB members in Ogbete Main Market on September 19, 2016, was because we embarked on a rally and sensitisation program, meant to enlighten the traders in Ogbete market, for them to observe the prayer and fasting for the immediate release of our able Director, Mazi Nnamdi Kanu and for other IPOB members arrested, and also for the freedom of Biafra. This was what we were doing in Ogbete market. We started our movement around 10:30am, then at about 11:00am, we went from the place that we kicked off and entered Ogbete market. At Elu, Express Line, to be precise, we met the security Chairman of the market, who took us from the Express Line to Omatta office. Omatta office is the office of the Chairman and the hall of Ogbete market in general. We never knew that they had already planned evil against us. When we started the rally, we went straight to the security man at the Omatta office in Ogbete who was very fierce with us, shouting at us and telling us that we didn't inform him about our movement, in spite of the fact that before then, we had already told him that we met with Temple Ude, who is the Chairman of the market. We told the Chairman on Friday last week that we are going to embark on a sensitisation rally to educate our people in the market for them to observe the sit-at-home, as well as prayer and fasting for the immediate release of our amiable Director, Mazi Nnamdi Kanu and other IPOB members illegally held in custody; but he(the security man) was very fierce with us. While he was abusing us, the Chairman Ogbete market entered the hall and told us that he did not order us to do anything and that he did not tell us anything. He said that we are there to castigate him and bring trouble; that he is going to show us trouble. He accused us that we put his name and phone number online, and people have been calling him to shut down Ogbete. He threatened to kill our Coordinator and he threatened to enter (infiltrate) IPOB and kill us all. In saying this, he said that he is going to show us now that he has power more than us. Then he ordered the security men of the Omatta to lock the door against us. Meanwhile, as a result of the fact that we are IPOB and non-violent people, we did not argue, we did not fight with the security or taskforce officials of Omatta, we obeyed the instructions. They told us to sit down, and we sat down, listening. We did not know that his henchmen,the Secretary of Ogbete market had planned against us and called the policemen from the CPS- which is Central Police Station, Enugu state. And when they came, they started beating us like slaves, they tamed us, they tortured us, they were using sticks on us as if we are criminals. They beat us with belts and baton and they castigated us and tied all of us together. They forced us to go down on our kneels and they were beating us as if we are animals and slaves. As we were walking to that place, they were rumpling our flag-the Biafran flag, they were twisting the Biafrans flag, and they were carrying our mega-phone, and throwing it up and down. They squeezed Biafran flag, which was very unlawful and also collected our phones and denied us access to make call. And when they were doing this, they took us from Omatta office to CPS in Enugu where they lied us down like criminals, thieves and slaves." he said. Another activist, famously acclaimed as Evangelists also gave his own account of the ordeal. "My dear brothers and sisters, the IPOB worldwide, my name is Evangelist Ezeh Chijioke Francis, a.k.a(Chijioke-Maria). Please I am here to tell you all the truth and nothing but the truth. While we were evangelising inside Ogbete Main market, all our aim was to tell the people to pray in solidarity with our leader, Mazi Nnamdi Kanu, for his release and for other Biafrans. Unknowing to us, that the Chairman, Temple Ude back-bited us. He was the one who gave us the go-ahead order to go and sensitise to our people. What he did is a back-bite, a sabotage. He called us inside his office and we sheepishly followed him without complain. When we got to his office, he started threatening us, that we want to stop him from where he is earning his living, that we want to throw him out of the office, and we asked him how, since he was the one that permitted us to hold the rally. He started threatening our Cordinator, that he will kill him, that he will enter inside IPOB and kill him, and kill all of us. Even right now, i know i can't hide inside the street because of the way i am. The Police know me, everybody knows me, i cannot hide, but my fear is that i want to tell the whole world that anyday that i am out of sight, let them know that it is Temple Ude and the rest, because the threat that day was very shocking to all of us. He threatened to kill our Cordinator, but I rose and asked him if he remember that our lives as human being is not in his hand. That was when he became very annoyed with me, because they have tried all means to stop me from preaching inside Ogbete market. He has called me once or twice into his office; in short his security men has arrested me more than two times to stop preaching Biafra in Ogbete market. I told them that it is a lie, that i will not stop preaching. I knew that this time around, he will find it as an excuse to destroy all of us. While he was threatening our Cordinator, i told him that Mr. Chairman, our life is not in your hand. That was when he raised his bell to hit my head before somebody rose and removed the bell from his hand; then he grabbed my Bible and started hitting me the Bible. Imagine a Christian, hitting someone with the Bible: what if it is Quaran? This thing is an eyesore, it is an affront to God, it is a slap to God to hit somebody with the sacred book. While he was beating me, the policemen hijacked me and they were kicking me up and down. And they were beating me, tearing my clothes and everything: infact if you see my Bible now, you will not believe it is the word of God. Even when one of our brother told the Policemen, how can you be beating this man like this? They turned and faced the man and started beating him mercilessly. From that time onwards, they caged us like animal and lied all of us on the ground and resumed beating us and hitting our head on the ground; infact this my body, there are bruises and marks all over. So my dear people of Biafra, i'm trying to tell you people that the terror these people carried out against us has not stopped here, because he(Temple Ude) must undertake that our life is secure in Ogbete market because we are worried as a result of his threat against IPOB." he concluded. "My name is Ikechukwu Egbenwodo, the Cordinator of Indigenous People of Biafra, IPOB, Ogbete Main market Enugu. On 19th of September being Monday, we gathered to evangelise and tell people about our upcoming "SIT-AT-HOME" prayer and fasting protest. Then, as we are going, the Omatta security Chairman met us on the way, at first Express of L1 precisely and asked us to come over to Omatta office. And when we came to Omatta Office, he began to ask me that he think he told me that we will see before. I told him that we are supposed to see but we have met with the Chairman on 17th of September at about 1:00pm, during which we discussed with the Chairman about our upcoming evangelism and our upcoming 'SIT-AT-HOME'. Then the Chairman gave us his words that we should go and talk to the people and appeal to their conscience, and we reached agreement on that. That was on Saturday being September 17. Then on Monday being 19, we went as we agreed with the Chairman to evangelise: unfortunately the security Chairman said that we should come up. We began to discuss. They began to shout. The first person that shouted is Mr. Philip Ikeji, he is the Secretary of Ogbete Main Market Enugu. As the tempo began to rise, then came the Chairman, Mr. Temple Ude and he began to threaten to kill me, that he will kill my families and destroy us, and that he will enter into IPOB and will send boys to begin to kill us one by one. That is what he said. As he was shouting, the engineer of the whole evil, Mr. Philip Ikeji began shouting and threatening us. Philip Ikeji is the architect of all the evil in Ogbete, he was the one that called the Police to come and arrest us. And he is the one that ordered his boys(Agboro) to lock all the doors. When the Police came, they began to beat us and torture us with all kind of stick and stone and all that. Mr. Philip Ikeji is an enemy of the people and Biafra, likewise Temple Ude the Chairman who gives him orders. He and Temple Ude collaborated to destroy us. I am using this medium to tell the world that should anything happens to me, my wife or any of my family members, or any member of IPOB, that Mr. Temple Ude and Philip Ikeji will be responsible for that." he stated. "We can never regret because our Director since day one has not regretted his movement. So how can we regret? For the fact that Biafran blood runs through our veins, we can never regret it. 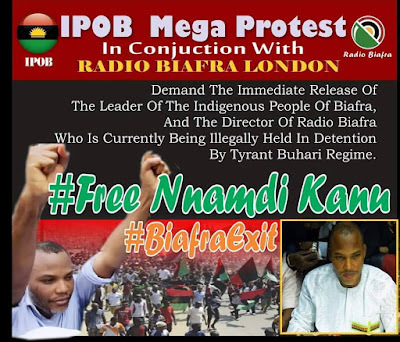 For the fact that Biafra restoration is still the number one goal of our life, we can never regret; and we are telling the same thing to all Biafrans worldwide and in the zoo called Nigeria and in Biafran land, every one of us cannot regret because our able Director, Mazi Nnamdi Kanu has not regretted his action, so we can never regret. We don't regret being tamed and castigated and tortured. Instead of us to regret, we will still fire on." The spokesman, Mr Stephen stated. "Our words of advice to IPOB all over the world is that this is an eye opener to all Indigenous People of Biafra and this is another thing to ginger our swagger, but for the fact that they are taming and holding us, it does not stop us from preaching the Gospel of Chukwu-Okikeabiama. For the fact that restoration of Biafra is our main priority on this surface earth, Biafra must be achieved. IPOB all over the world should let the fire to keep on burning and at the end, we shall all triumph in Chukwu-Abiama's name I pray- ISEE!!!" Great job! The legal system must be put to work.